This was the weekend where we tackled the scary closet/pantry. It holds six trash bins for plastic, glass, aluminum cans, magazines, cardboard and newspaper. I set it up when I got here because after recycling for five years, it’s in my blood! Unfortunately there’s no curbside recycling here, so we save it up and take it to the huge bins, and then I walk my white paper recycling to work– because the college is the only place that recycles white paper. In fact, I’m not sure the glass even has a place to be recycled yet, but they are saving it just in case. Anyway, after sorting a couple months worth of refuse, I got to thinking about the bag of clothes I had stashed in the corner to give away. In some ways, it’s hard to part with them because they’re just a tad too small now. 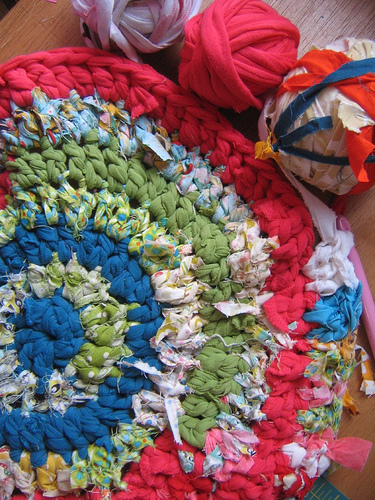 Instead, I decided to combine them with the scraps I save from each project and start my own rag rug. Specifically, it’s going to be a bathmat, to replace our icky brown one. It is using up a lot of fabric– when I took this photo I’d used two or three good sized balls of scrap strips (I save them when I square off my quilt blocks or have extra bias tape, etc), a jersey dress (the orange), and the remainders from my refashioned tees. I found one more old shirt hiding in the bin and a couple pieces of fabric I’m not enamored with, and proceeded to tear them up. Once I crochet those things in, the rug should be a pretty good size. And now I know I have a use for all of the scraps I hoard like crazy, which makes me feel better about keeping them. I think I’m going to cruise my closet again, too…. and be honest about what I’m really wearing, and what’s just taking up space. In other news, tonight I am (hopefully, assuming my machine has arrived) going to my first class at the Bernina store. Eeeee. very nice! I was just thinking about doing one of these myself! thanks! I think I may be slow to finish because I don't want to just use fabric for the sake of using it, I want it all to be otherwise-destined-for-trash. Of course, that may just motivate me to get rid of things I never wear/use. 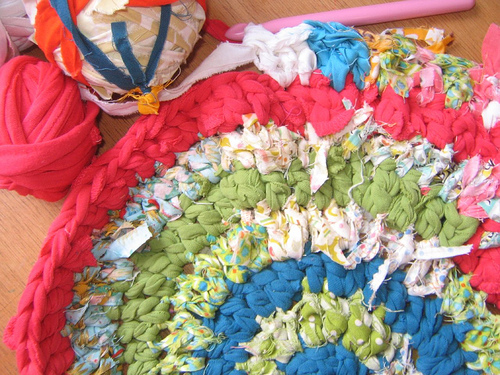 oooo, that's going to be a lovely rug when it's finished! !